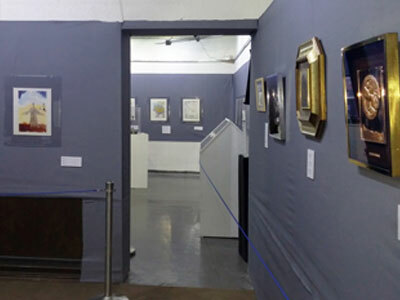 First time in Latvia, original works of Salvador Dalí, Marc Chagal and Giorgio de Chirico, inspired by Biblical themes are now in Latvia, Center of Contemporary Art, Riga and is realized in partnership with Collection Kesauri. Exhibition is open from 10.10.2015 to 31.01.2016 and is featuring 96 original works of one of greatest masters of our time. 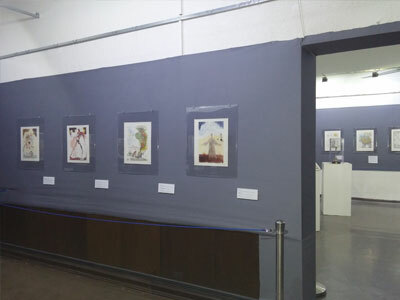 Exhibition Salvador Dalí, Marc Chagal, Giorgio de Chirico: Biblical themes from Collection Kesauri consists of works by artist, which evoke the shocking and surreal dreamlike image of the early twentieth century. 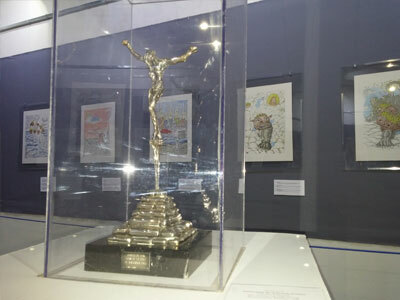 The exhibition offer the possibility to admire original lithographs, sculptures, medals, serigraphs on silber and silk and executed on other medias original works of greatest artist of our age - all on religious themes. That show us how religion had an important part in Dali's spiritual life and have found expression in the masterpieces created by him. 2. Cycle of "The Twelve Apostles or Knights of the Round Table"
3. Medallions from the series "Twelve Tribes of Israel"
4. Series of medals "The Ten Commandments"
5. 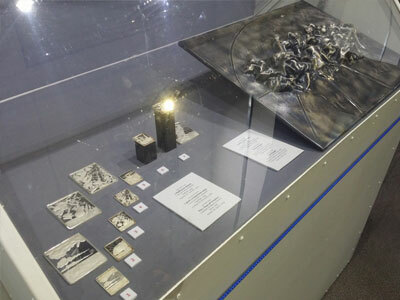 Series of medals "The Seven Days of Creation"
Section one introduces visitors to one of Salvador Dali's greatest artistic passion: engraving, or lithography to be more precise. An exceptional series of works show us how Salvador Dalí interpreted traditional religious subject matter in a way that expresses both contemporary reality and the central mystery of the Catholic faith. The fire of Dalí’s undeniable talent once burned recklessly, but here glows in the hearth of Christian tradition. Paternoster portfolio is an assemblage of religious scenes and other symbols with personal significance to Dalí that he often repeated in his works. Section two - Cycle of "The Twelve Apostles or Knights of the Round Table"
This series has been extremely important for Salvador Dali as being created in 1977, was the fruit of his long years of internal search and access to God. Dali was always worried by themes of sin, shame, faith. It is no coincidence cycle has a double name - the "Twelve Apostles" or "Knights of the Round Table". The cycle of legends about the Knights of the Round Table tells the story of knights, immaculate in the knights etiquette, pures in their thoughts and deeds involved in the search for the Holy Grail – the cup in which Joseph of Arimathea collected the blood of Jesus Christ. It is precisely these pure human qualities and willingness to perform feats and be martyred in the name of ideals and faith who joined together for Dali the 12 apostles and the 12 knights of the round table. To emphasize the singularity (the divine sublimity) of lithography, Dali decorated images with gold dots and a thin gold border. 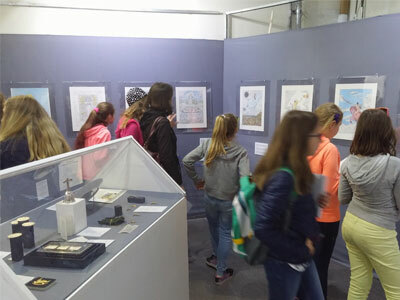 Each lithograph has a double name and a short explanation of the author, appealing to the symbols of cultural studies, comes to us from the Middle Ages. 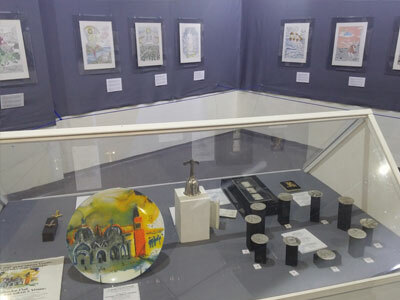 Section three - Medallions from the series "Twelve Tribes of Israel"
In celebration of the 25th anniversary of the State of Israel, Salvador Dali created a series inspired by the Twelve Tribes of Israel. A surrealistic tribute was fitting, considering the remarkable history involved – the progression of the tribes from their descendants to the third Jewish State after two thousand years of exile. Salvador Dali, the greatest Surrealist master of all time, was a natural selection to depict the first Israelites. His skill extended to every medium, and most importantly, Dali understood and knew how to represent, in his own creative surrealistic style, the ancient thoughts and dreams of the people of Israel. Even though his works can be interpreted ambiguously, this series captures the tribal memories of those who live and work in Israel in a precise and significant manner. Dali’s fertile imagination captured mystical characters in a tangible way, immortalizing the Israeli civilization for future generations. 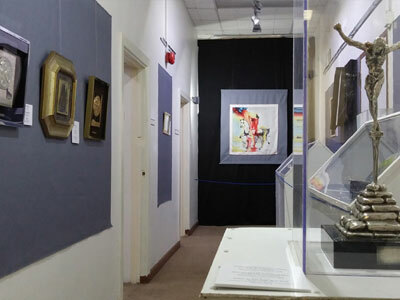 The Twelve Tribes of Israel suite is an important and considerable body of work in Dali’s, and indeed Israel’s, history. Each depicting one tribe, the obverse side contains another creation: "Hora Around the Menorah". The medals are minted in very limited quantity and are a stunning artistic collection, both unique and valuable. Section four - Series of medals "The Ten Commandments"
The Ten Commandments, also known as the Decalogue, are a set of biblical principles relating to ethics and worship, which play a fundamental role in Judaism and Christianity. God inscribed them on two stone tablets, which he gave to Moses on Mount Sinai. 10. Thou shalt not covet neighbour's house, neighbour's wife, neighbour's servants, animals, or anything else. Section five - Series of medals "The Seven Days of Creation"
Genesis is the first book of the Law of Moses or Torah which consists of the first five books of the Bible. There are seven periods of creation recorded in the beginning of Genesis. Although each of these has been translated as a “day”, the Hebrew word is “yom” which simply means a period of time with a beginning and an ending. Dali Illustrated these 7 days/periods of creation of the world in form of 7 silber Sculpture-Volume Medals. Amazing Marc Chagall's the Twelve Maquettes of Stained Glass Windows for Jerusalem. 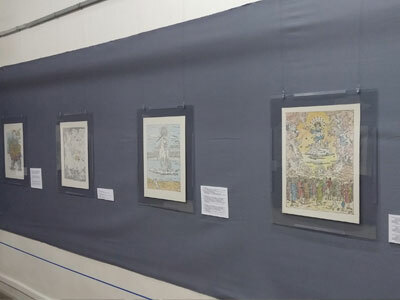 Marc Chagall’s Windows of Jerusalem lithographs are some of the most important works in Chagall’s oeuvre as they showcase the beauty and intricacy with which Chagall designed an architectural masterpiece in the stained glass windows at the Hadassah-Hebrew University Medical Center. The accumulation of years of labor, this lithograph series portrays Chagall’s passion for religious narration and the inescapable draw that everyone has to his dreamy interpretation of them. Giorgio De Chirico has the courage to look at the vision of John with the eyes of a child who relies totally on the goodness of the Father and of the Son, the tenderness in the night of Bethlehem. And here the picture is a sacred freedom overwhelming: is hope and play together, liturgy and the stage. Everything is accepted and imagined, except the fear and horror of the abyss. There is no disrespect, but the consciousness of mercy. The religious themes in de Chirico is developed in the forties, from engravings to the Apocalypse and continues in later years with a search unknown, and often unprecedented, the outcome complex and problematic. 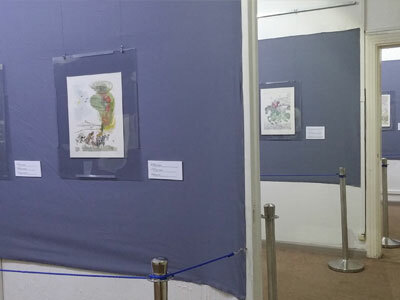 Illustrations inhabited by monsters and dragons, are presented by Giorgio de Chirico with images whose purity and completeness are close to childish vision: obscure, very simple and complex in philosophical and religious symbolism at the same time. That combination a peculiar perception of the world one of the greatest artists of our time - de Chirico, symbolist and surrealist, feed from the roots of classical art evergreen tree. Monday to Sunday 10 a.m. to 8 p.m.
- Adult : 5 Euros. - Children (between 7-17 years old), senior, student : 3 Euros. 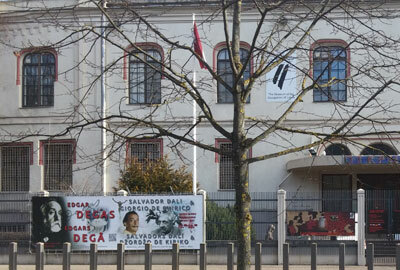 - School groups - minimum 10 children : each children - 1 Euro, teacher(s) with children group - free entrance. - Children under 7 years : free.